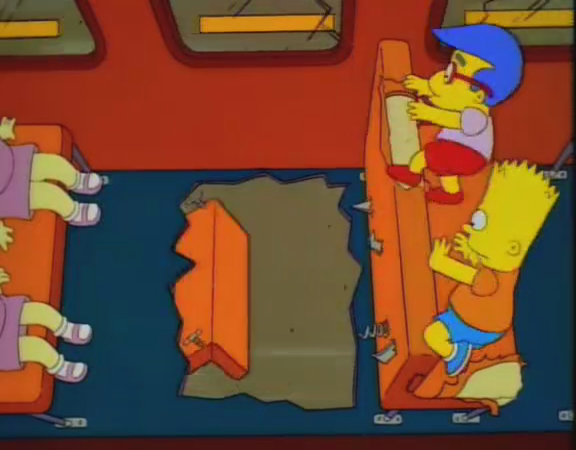 Social commentary was a strong component of the Simpson’s from the very beginning, but no episode skewers the roles parents, teachers, and administrators play in Springfield’s seemingly only school better than “The PTA Disbands.” The episode begins with the Springfield Elementary School bus making its way down a rural road towards a Civil War battle site. Within just a few seconds, we see a broken bumper creating sparks on the asphalt, a gaping hole threatening to swallow Millhouse and Bart alive, several cross-eyed children choking down exhaust fumes, and principal Skinner instructing the children to use their clothes as drag parachutes. When “The PTA Disbands” first aired in 1995, it was likely exhausting to watch. The satire here is packed tightly into the 22-minute run time, leaving little room to digest a joke before the next one arrives. By the time the bus reaches Fort Springfield, the writers have already covered inadequate school funding, privatization of heritage sites, and the poor treatment of public employees. After the children are run out of the fort (R.I.P Ooter), tensions between Ms. Krabappel and Principal Skinner begin to heat up in the cafeteria – where malk and meat blended with newspapers and gym mats is being served. The battle brewing here between the teachers and the administrators has no real antagonist or protagonist. Krabappel’s examples of the school’s lack of funding, including a ‘banned’ book titled “The Theory of Evolution,” are persuasive, but even if Skinner agreed with her point, he doesn’t have the resources to meet her demands. The writers are concise in their commentary here: educational failures of our society are not the fault or teachers or principals. Who’s to blame? As the community tries to work together to find out how to deal with the teacher strike, the answer becomes clear. Before the titular part of the episode arrives, chaos ensues in Springfield as the children have nothing to do during the day. Each kid, expect for Millhouse, approaches the lack of structure uniquely. Lisa soothes her anxiety by creating a mock school setting in the Simpson’s house and creating a perpetual motion machine, Jimbo enjoys soap operas with his mother, and Bart disrupts order within the community in devilishly clever ways. His ability to create a run on the banks in just a few seconds is one of the highlights of the episode. When Marge gets creeped out by Bart’s nighttime kite flying and Homer refuses to let Lisa disobey the laws of thermodynamics, it’s finally decided that the PTA needs to do something about the strike. As the meeting starts, its quickly apparent who’s to blame for this entire mess. Everyone is in favor of giving the teachers what they need to create a positive future for the children, but no one wants to pay for it. Krabappel’s and Skinner’s arguments eventually devolve into single-word sentences and hand motions as the parents chase their own tail. Springfield’s citizens have already proven themselves too incompetent to simply raise a bit of money for their schools, so who better to entrust the education of their children than those very same citizens? The replacement teachers at Springfield Elementary include Moe, Jasper, and of course Marge, whose presence forces Bart to work against the strike for the first time. “The PTA Disbands” is at its weakest as the characters, now realizing this band aid isn’t working, try to find a solution to the strike, but there are still plenty of good jokes.